Students at the University of New Mexico come from all walks of life. Some are leaving home for the first time, some have battled through adversity and some are returning after decades away from any sort of formal schooling. Regardless, their decisions to return to school were driven in part by life’s experiences. "I am the first in my immediate family to go to college, and the first in my immediate family to attend grad school. I have been working with children with special needs for 10 years, and receiving this degree will help me provide higher quality services to my clients. "I look forward to starting my own business where I can achieve my goal of giving back to my home state. My mom and dad never had the chance to go to college, neither did my grandparents. So after this next graduation day, I will give my diploma to my parents to show my respect and to honor to my family." "My desire to graduate with my Family Studies Degree has been an enlightening journey. I changed degrees during my reign as Miss Jicarilla Apache, because I saw the lack of public, societal, and family education that my reservation did not have. "As I got closer to my graduation date, I furthered my research and understanding that lack of family education and support for my Native American brothers and sisters did not go far from Albuquerque. I started using my degree by being involved with my children's daycare, tribal college Early Childhood Education Program, Parent Task Force at the daycare, and co-founding a multi-media outlet informative." “I am from Jalisco, Mexico, a state with a high rate of out migration to the United States. I first found a home at UNM’s Center for English Language and American Culture because to improve my language skills. At UNM, I navigated the education systems and found scholarships to finance my education. It was a struggle, but I went from almost losing my scholarship to earning a 4.0 GPA. "Music has the ability to channel creativity through sound, yet it also has the power to affect all of our senses by making the listener see beauty or feel exaltation. I can capture this bliss through my saxophone, a beautifully engineered piece of brass that is capable of singing sonorous melodies. My childhood was dedicated to the saxophone, which I discovered most naturally in the jazz setting. "Jazz is the reason I can get up in the morning and get through tough days. Jazz empowers me with the fulfillment that I am part of a rich legacy founded and woven by some of the greatest musicians to ever walk this planet. Jazz has helped me understand who I am. Jazz comes from our way of life, and because it's our national art form, it helps us to understand who we are. "My ultimate goal is to become a Jazz Studies professor, which would enable me to teach this beautiful art form and give as much as I can to Jazz Education. The prestigious program at the University of New Mexico has helped me realize this ambition. I plan to pursue a Master’s in Jazz Studies performance at the Eastman School of Music. I am confident it will help me broaden both my knowledge of music, and my experience performing and teaching. Thank you UNM!" "On May 20, 2005, I graduated with my Associate's degree. It was on that day that my terminally ill mother made me promise that I would finish and pursue my Bachelor’s degree. Five months later, I lost my mom to cancer. Three years ago, I realized that it was time to fulfill the promise I made to my mom, and on May 9, I will fulfill that promise. "This accomplishment is for my mom; she has been with me in my heart and thoughts through this endeavor. The picture I took with my mom on the evening I received my Associates degree is the background on my phone and laptop. It resides in a picture frame in my office at work and in my home office. That picture is a constant reminder of why I am pursuing this goal. "It is because of her unconditional love and unwavering confidence in me that pushed me to pursue my Bachelor's degree. "Mom, thank you for always having the faith and confidence in me to accomplish anything I put my mind to. You are my driving force! I love you!" 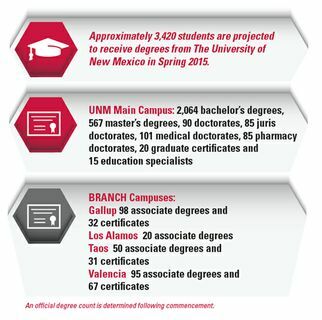 More than 3,400 students graduated from the University of New Mexico the weekend of May 8-9. "When I returned to UNM to finish my degree, I was a 29-year-old single mother of four children, ages 6 and under. I began college and got a part-time job. It was very hard to balance four small children, work and school, but I made it work. "I have worked so hard, and there have been a lot of obstacles that could prevent me from finishing, but I’m determined to graduate. I plan to graduate in front of my five children and hopefully make them proud. I hope that my love of education and determination inspires them to get an education and be hard workers. It’s been a hard journey, but I am almost there and plan to apply to grad school in the fall." "I was diagnosed with leukemia when I was 14 years old. I underwent three years of intense chemotherapy treatment with the pediatric oncologists at UNMH. It was because of this battle with cancer and the physicians who treated me that I decided to pursue medicine. "It was the sensational doctors at UNM that have helped make me who I am today. They helped me survive cancer as a patient, and then became my greatest mentors and teachers as a medical student. There is a reason I stayed here for medical school. It's because this hospital and the faculty have been my home and family from Day 1. "It's time to start a new chapter in my life and I can honestly say I owe a lot of my future, my passion for medicine, and my graduation from medical school to the very doctors that treated me for cancer in high school. This is a remarkable institution giving passion and healing a new definition."